Distribution and habitat: Chamaedorea seifrizii is native to Mexico and Central America where it thrives as an understory palm in rainforests and it is often spreading by means of underground runners, forming clonal colonies. Chamaedorea seifrizii is an useful indoor palm because its adaptability to the environment, exotic look and anti-pollutant abilities. It is very common in malls, offices, homes and courtyards. Description: Chamaedorea seifrizii is a relatively small graceful palm with densely clumping, bamboo-like stems and feathery fronds. Canes can be up to 1cm (0.4 inch) in diameter. The delicate-looking, lacy leaves 60-90cm (24-35 inch) long with leaflets up to 38cm (15 inch) long at the top of slender, cane-like stems that cluster together. Leaf colour is a deep bluish green. The flowers are produced in inflorescences; Chamaedorea seifrizii are dioecious, with male and female flowers on separate plants. The fruit is an orange or red drupe 0.5–2cm (0.2-0.8 inch) diameter. Houseplant care: Chamaedorea seifrizii is a thin clumping palmtree, spreading by offsets and stolons, growing very slowly up to about 1.5-3m (5-10 feet) in height and spreading about 75cm to 1.2m (2.5-5 feet) – container grown palms. As the old fronds die, these should be trimmed off and the leaf bases or sheath allowed to dry out. After the sheaths are dried, they should be removed for good plant hygiene and to unveil the attractive light green bamboo-like stem. Light: Chamaedorea seifrizii palms like bright filtered light. If kept at a distance from a window for extensive periods in winter, they begin to grow spindly. Temperature: Though Chamaedorea seifrizii can tolerate a wide range of temperatures, they do best in normally warm rooms 18-24°C (64-75°F). It tolerates winter minimum temperature of about 13°C (55°F). Even though Chamaedorea seifrizii will tolerate dry air, it may cause frond tips to turn brawn. Increase humidity by standing the pots on trays of damp pebbles and mist spray the foliage regularly. Watering: Water Chamaedorea seifrizii plentifully as often as necessary to keep the potting mixture thoroughly moist during the active growth period, even permitting water to remain in the saucer. During the rest period water moderatelly just enough to make the potting mixture barely moist, allowing the top two-thirds of the potting mixture to dry out between waterings. 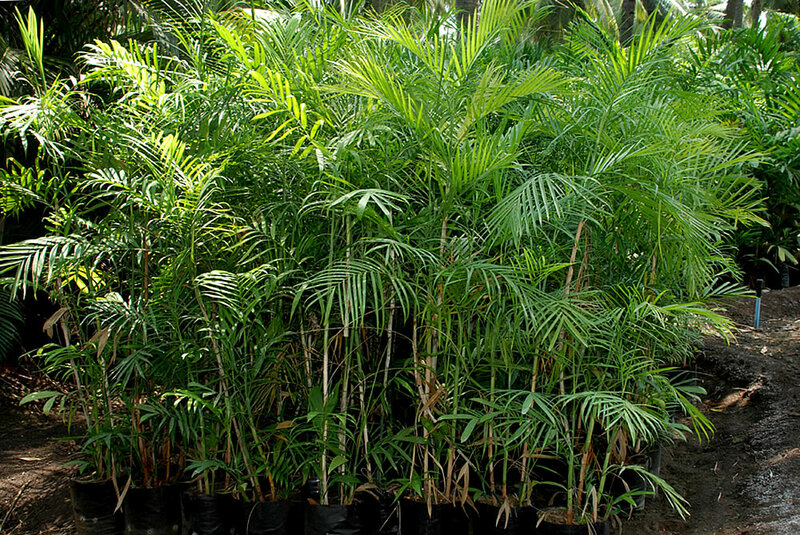 Feeding: Chamaedorea seifrizii palms will benefit from a couple of application of recommended liquid fertiliser at half strength during the growing season to encourage strong, lush growth. Potting and repotting: Use a soil based potting mixture with addition of half as much extra peat moss or leaf mould. An 18cm (7 inch) pot is likely to be the biggest needed. Repot Chamaedorea seifrizii only when its roots have completely filled the pot and then move it into a pot just one size larger, working the potting mixture carefully around the brittle roots. It is essential to pack the mixture down firmly, but without damaging the palm. Root breakage will slow down development and a palm with damaged roots may take several weeks to fully recover. 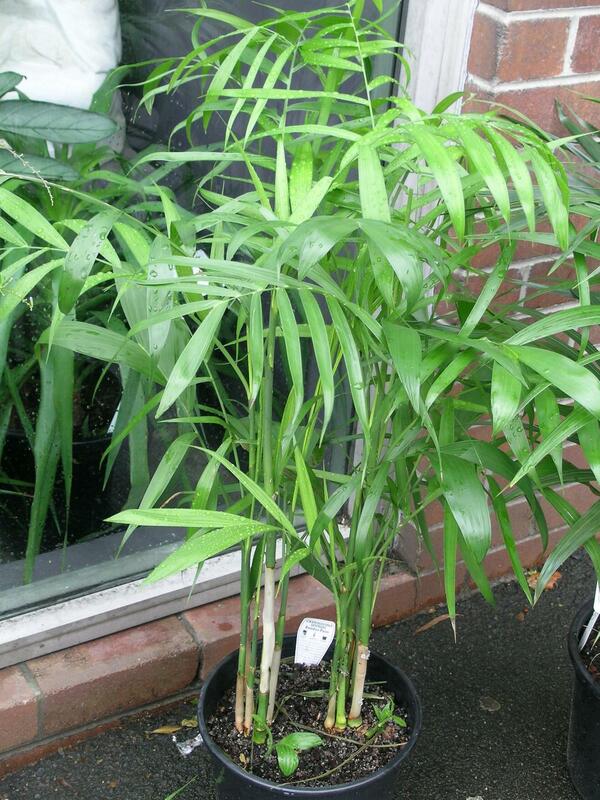 Gardening: Chamaedorea seifrizii palms are very easy to grow and maintain within their hardiness zone. Palms grown outdoors have a thicker canopy than indoor specimens. 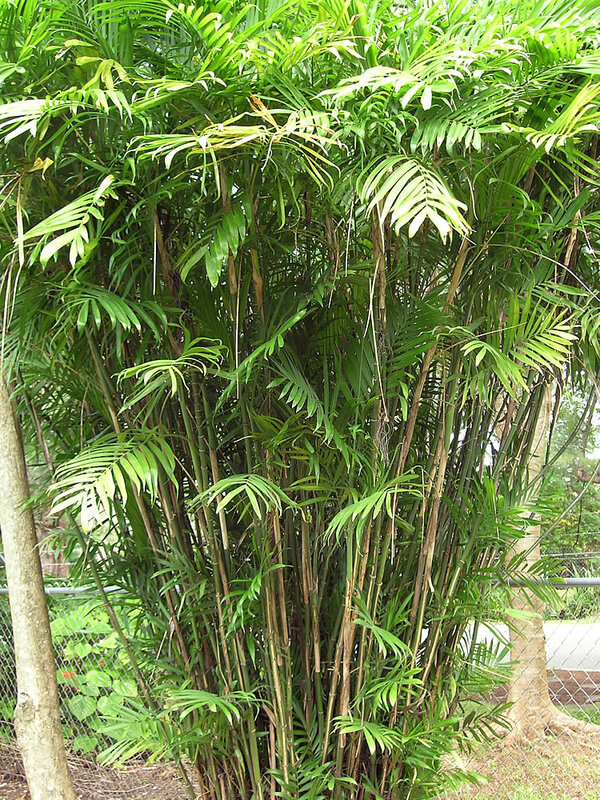 These palms grow at an average rate and can get up to 2.4 to 3.6m (8-12 feet) tall and 1.8 to 2.4m (6-8feet) wide. Locations: Chamaedorea seifrizii is requiring a partly shaded to shade position. This palm prefers shade but can be adapted to partial shade. Soil: Chamaedorea seifrizii palms grow best in moist, humus rich, well-drained soils. They need mildly acidic to mildly alkaline soil for healthy growth. Late spring to early summer is the best time to plant an outdoor palm. Prepare the area several months before planting; remove the roots of perennial weeds and mix in bulky organic materials such as well-decomposed manure or garden compost. The day before planting, water the potting mixture in the container. Also water the planting area; allow the surface soil to dry slightly before planting. Where the soil is well drained, plant the palm in flat soil. Dig out the hole and form and firm a slight mound, so that its surface is fractionally bellow the surrounding. Draw the soil around the root ball and firm it. Where the area is predominantly clay and badly drained, mound the soil to form a raised area. Dig out the hole and plant in the same way as for a flat area. After planting thoroughly water the soil. These palms are shallow-rooted and a yearly mulch in late spring, after the soil around was cleared from weeds and watered, helps to feed the palms and keeps the soil cool and moist during the hot weather. Spread a 7.5cm (3 inch) thick layer of well decomposed garden compost over the soil. Irrigation: Chamaedorea seifrizii is require good drainage and the soil should be allowed to dry slightly between watering. 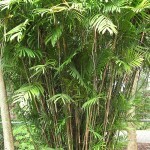 The roots of these palms spread widely and laterally and therefore it is essential to thoroughly soak a wide area. This is best undertaken during evenings or early mornings when the chance of water immediately evaporating is low. Feeding: Chamaedorea seifrizii palms are sensitive to soluble salts, but they will benefit from a couple of application of recommended liquid fertiliser at half strength during the growing season to encourage strong, lush growth. Propagation: Propagation of Chamaedorea seifrizii is not practicable in the home. Chamaedorea seifrizii is usually propagated by seed which takes 6-9 months or more to germinate and require high temperatures up to 32°C (90°F). Later, high humidity is needed to prevent the seedling shriveling and to ensure rapid growth. Sow seed in standard germination medium in seed-trays ensuring that individual seeds do not touch. Place the seed-tray in propagation frame with bottom heat and keep the soil moist. After germination, reduce the temperature slightly and after about 9 months, repot the seedling to small but deep, individual pots. Until established, keep them in light shade and gentle warmth. Production of Chamaedorea seifrizii palms often includes several months in full sun to encourage basal shoot production and good stem diameter, but these species develop their best color in shade. As the plants get larger they are then stepped to a larger size pot. These palms will reach a salable size in 2-5 years. Propagation of Chamaedorea seifrizii by removing the suckers or offshoots from the parent plant is also common. This is best to be done in late spring or early summer. Use a spade or trowel to draw soil from around the base of an offset. Use a sharp knife to remove the offset from the parent; sometimes an offset has roots and these have a better chance of survival than offsets that do not. Before the offset is entirely removed, partially sever the offset’s base and if the offset has no roots, repack the soil around it. Later, when roots have formed, this offset can be removed. Transfer the rooted offsets to individual pots and keep them watered and lightly shaded until they are well established. Problems: Chamaedorea seifrizii are usually easy to maintain disease free. As with most palms the biggest problem with pest is mites. These very small, spider-like, eight-legged insects, cluster on the underside of the leaves, sucking sap and causing yellowing and mottling. 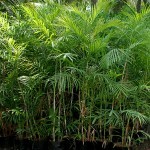 Treatment: Regularly cleaning the palm’s foliage with a soapy solution will help reduce mites attacks. Also can be used an acaricide. Scale insects are another pest to watch out for when growing Chamaedorea seifrizii. Infested plants become weakened or stunted and begin to die. Scales can be found feeding on leaves, petioles, or stems. They are usually distinct from the plant material on which they are feeding. Their shape (round to oval), size (pinpoint to 2 mm long), and color (light to dark brown) are quite variable and many scales are hard to distinguish from the plant material on which they are feeding. Treatment: Wipe off the young scale insects with a cotton bud dipped in methylated spirits. Oil-based sprays can be also used. It is much difficult to eradicate the adult insects which are protected by a scale-like shield. Apply repeatedly sprays at two-three weeks intervals with a systemic insecticide. White cottony masses on stems are caused by mealybugs. They cluster under leaves and around the junctions of stems and leaves, sucking sap and causing weakness in the palm. Dry potting mixture intensify the problem. Treatment: Eradicate small infestations on indoor palms by wiping them with methylated spirits. Alternatively can be used a systemic insecticide. Excessively wet potting mixture encourage leaf spot disease caused by a bacteria and producing dark brown spots on the leaves. Treatment: Cut off infested leaves and spray with an adequate fungicide. Dry potting mixture may cause yellowing the leaves, especially during the summer. Treatment: Thoroughly moisten the potting mixture. Dry air may cause dull colour in leaves and tips become brown and dry. Treatment: Regularly mist spray the palms, especially during the hot weather. Check that the potting mixture is moist but not waterlogged. Excessive watering and/or poor soil drainage can induce root and stem diseases such as Pythium, Phytophthora, or Rhizoctonia. Symptoms are very severe: roots blackening or mushiness followed by yellowing, wilting and loss of the palm. 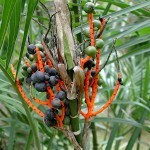 Treatment: The palm affected by these fungus will be lost. These diseases can be prevented by using pathogen-free potting medium and pots. The potting mixture moisture should be maintained as low as possible to reduce pathogen growth. 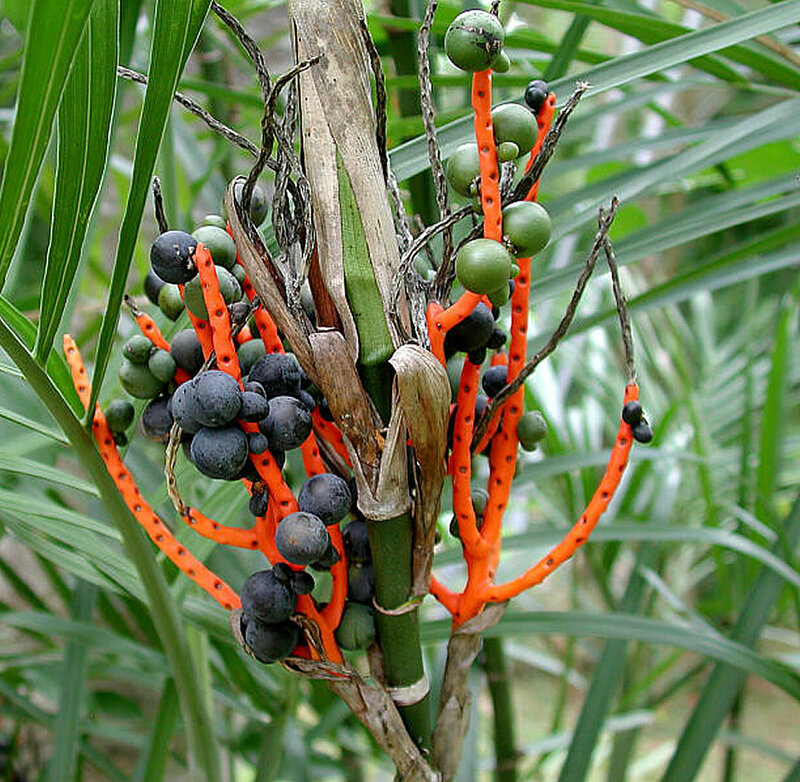 Toxicity: All parts of Chamaedorea seifrizii palm are poisonous if ingested. Uses and display: Chamaedorea seifrizii is a useful plant for landscaping in the garden, for containers on a shaded patio or indoors in filtered light. Small palms can be used in table top arrangements to create exciting display. Tall sized palms are ideal companion for houseplants in a floor display. Also a tall palm can be used as a specimen display and if it is used a spotlight to illuminate the palm, it will create interesting wall shadows. In warm climates it may be used in protected areas outside as a screen, hedge or accent to the landscape. According to NASA, it removes formaldahyde and is also said to act as a natural humidifier.